The Academy is where you do all of the research for upgrades in the game. There is only ever one Academy research queue, so try to make sure you are always using it. As you progress in the game you'll see some ridiculous research times for things, some over 50 days for the higher level troop upgrades. 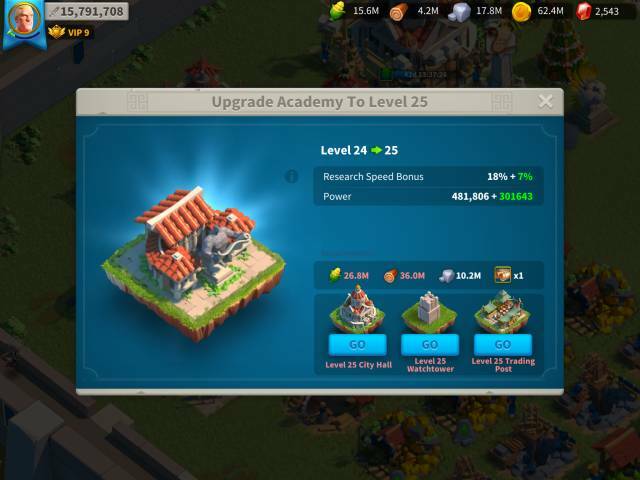 1) Upgrade your academy level as much as possible, it is expensive to upgrade and takes time, but for each level you increase it, the bigger research speed bonus you will get. At level 1, the research speed bonus is 0.5% and it goes up in 0.5% increments up to level 20. So at level 20, your research speed bonus will be 10%. When they become available, upgrade to maximum Engineering and Mathematics, that will maximize your builder speed and research speed bonuses. With mathematics at level 10, you'll get a 15% research speed bonus. The research speed bonuses are really important later in the game so you may as well get them done as soon as possible. If you are about to begin a very long research task, as your king for the Scientist buff, this will give you a temporary boost to research speed for any research items that you start while buffed. Once you have started the research, you can ask the King to take the buff back, so they can allocate it to someone else. Don't forget to thank the King! On certain event days you get to complete events and gain rewards for using speedups. Look out for those days and use your speedups then. This is an incredibly long process, even for pay to play players. If you are free to play, then it will literally take months of research time, even using speedups and buffs. It is possible, but you'll literally need all army research done before T5's are unlocked, with some of these items taking more that 50 days each / you can start to see that unlocking T5 troops will be an incredibly long process!